First of all, the secessionists want to found a federal republic, composed by many lands and/or peoples: Lombardi, Piemontesi, Liguri, Trentini, Veneti etc. more or less one people for each of the Northern Regions of Italy. Every 'people' has its own flag: that's why on 'independence day' there were a lot of different flags. Lega Nord is a federation of many regional movements. Both the symbol and the boss of Lega Nord are those of Lega Lombarda. Lega Nord is not the only autonomist movement of Northern Italy, neither the oldest: e.g. Liga Veneta is older that Lega Lombarda; in Alto Adige there is the Süd Tirol Volks Partei, that is an autonomist (but not indipendentist) party. Note that the names of these movements changed after joining Lega Nord: e.g. Lega Nord Liguria was named "Union Ligure", Lega Nord Toscana was "Alleanza Toscana". For the Region "Trentino-Alto Adige" there are two movements, because Trentino is the Italian spoken part and Alto Adige is the German spoken one. Also for the Region "Emilia Romagna" there are two movements, maybe for historical reasons but currently there are no differences between these two parts. Note that there are also Umbria and Marche, even if these Regions are not in the Po Valley and belong to Center Italy. I received news from Italia. 41 issue of thed Quaderni Padani, supplement of "La Libera Compagnia padana", show a "official chart" of the historic Padania (inspired by the League leader Gianfranco Miglio) with several flags pictured by Alberto Filippi. Luckely Filippi can be contacted by Massimo Bonini, corresponsal of Flag Report for Padania, and one of the better padanian flags expert , who recently discovered a new historical flag for Italia: the Flag of the repubblica Cremasca (one of the republics proclaimed following the arrival of the french troops) whose details will are issued in Flag Report 31. -The autonomist of the region (Province) of Turin. This flag was manufactured in several exemplars but manufacturer made a mistake and all the flags currently in use have a color that is wrong according the official design, but I assume that for the real flags the mistake will are not corrected until the next path of manufactured flags (from other flag manufacturer, surely!). While we have two flag: the prescribed but not used one, and the really used one. Lega Nord is certainly a flag-loving and flag-using party. However, in a number of cases these flags are really existing on paper only (or in silico). In a number of years researching Italian political flags I have never seen the flag of Umbria or Marche or Romagna, as shown here. I've been to Valle d'Aosta this year and I haven't seen this Valdostanian flag either (only the well-known bicolour). Certainly in use are: Piemonte, Lombardia, Trentino, Toscana, Veneto, Friuli Venezia Giulia (the flag is actually for Friuli only) and Emilia. I am not really sure (i.e. perhaps in use, but rarely) about Liguria. And I haven't seen this particular version of the South Tirolean flag either. Not even the local Lega Nord branch is using this flag (I have visited them twice). Valdostani use a red - black flag. Val d'Aosta - white cross and the upper two quarters red; the lowers black. This is the flag of Val d'Aosta/Aosta Valley used by autonomists of Lega Nord. I saw it in some Lega Nord meeting. Emilia - quartered flag, 1 and 4 blue cross on yellow; 2 and 3 red cross on white; above is a blue stripe with red label and three golden lys. The Lega Nord flag of Emilia Romagna - the blue cross on yellow is traditional of Emilia, St.George cross is typical of Emilian (and Padan) municipal heraldry. I think that the 2nd and 3rd parts of the flag (argent, a cross gules, a chief azure charged with three fleur-de-lys or) are the CoA of Bologna. Friuli uses a blue flag with a golden eagle. Friuli - blue (dark) with golden eagle tongued and armed red. The so-called "Acuile tal Friul" (Friul's Eagle), symbol of this nation from 3rd April 1077, when in Pavia Enrico IV, Emperor and King of Germany gave to Patriarca Sieghard d'Aquileia the title of Duche. But the first eagle on flag in Friul was seen in XIV century; it was the symbol of Patriarca Baltram de St. Genie's; that eagle was taken as a model for the several future graphic elaboration. The eagle painted as a fresco with the Boemia's Lion on Palace de' Puppi and the one on Palace of san Giacomo place in Udine, are dated during the government of Patriarca Nicolo' di Lussemburgo (1351-1365). The ore eagle in blue field is also the CoA of Aquileia and Udine's province.Nowadays are used two different version of the "Acuile"; the first one has proportions 1:1 and it is the most used one, not only by autonomist political parties, but also by common people. The second one is the one officially adopted by Lega Nord Friul, proposed by G.Oneto in 1992. Ligurian's flag is the red cross on a white backgrounf. On the top left, there's an image of St. George while he's killing a dragon. 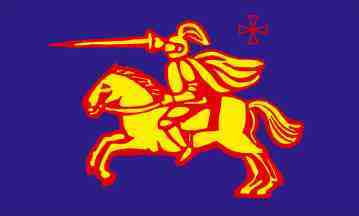 The red cross with St. George killing the dragon is only a party flag of Lega Nord Liguria. The exact denomination is "Union Ligure" and the flag is really the S.George one, as shown above. See <members.xoom.it/liguriaind/movaut.htm>. Lombardi uses the flag of Milano (white with red cross) with the blue medieval warrior superimposed on it, that is the flag of Lega Lombarda, the main part of the secessionist party Lega Nord. Lombardy - the well known red cross on white. This flag is listed under number 53 at the chart "Flags of Aspirant Peoples" [eba94] as : "Lombard League (Lega Lombarda) - Lombardy, North Italy." The medioeval warrior is Alberto da Giussano, the Lombard leader ofn Compagnia della Morte in Lega Lombarda that defeated the Emperor Federico Barbarossa in Legnano Battle (29th May 1176). The profile of this popular hero, symbol of the modern Lega, was designed by Umberto Bossi ispirated by the statue of Alberto da Giussano in Legnano (MI). For more information visit the site of "Alberto da Giussano" at <albertodagiussano.virtualave.net>. The cross fimbreated white is the flag of the "Lega Lombarda", not of Padania: in the Middle Age it was a league that joined 36 cities of Northern Italy (the "Commons"), during the war against the German Empire. The name "Lega Lombarda" and its symbols has been retaken in the '80s by a political party led by Umberto Bossi, which aims vary from a federal system in Italy ("devolution") to a secession of the northern Italy (called "Padania"). The red cross in white field then stands only for the historical and political "Lega Lombarda", not for all the peoples of Padania. The flag of the political party "Lega lombarda" is the red cross on white background with the warrior superimposed. YouTube (film added 8 Apr 2008 by "telepadaniatgnord") showing the Marche flag. However the entire emblem, including the cross, is rendered in yellow. The Piemontese flag is quite obvious: a white cross on red field (Savoia) with an azure lambel. It is the official flag of Regione Piemonte. Piemont: white cross on red with blue label and all bordered blue (dark). This flag is listed under number 50 at the chart "Flags of Aspirant Peoples" [eba94] as :"Piedmont (Piemonte) - North Italy." Nowadays el Drapo' is used with and without the blue edging. The simpliest one is used by Padan Indipendentist Movements).